Commerce, CA – 03/28/18 – DECO Lighting is excited to introduce groundbreaking Flat Optix™ technology to the lighting industry with the release of two all-new LED fixtures, the Skyler and Circa interior architectural luminaires. Designed specifically to refract light away from the 60 to 90-degree offending zone of a luminaire, Flat Optix™ micro-prismatic lens delivers a Unified Glare Rating (UGR) of less than 19, indicating that most occupants of a space will not be disturbed by the uncomfortable lighting glare that has become prevalent in recent years due to increases in product efficacy. Flat Optix ™ is a revolutionary system that will enhance and redefine an occupant’s experience within modern interior spaces. The ability to drastically diffuse and redirect light is a key attribute that allows for softer, well-balanced illumination for office spaces, educational facilities, themed areas, and healthcare applications. “All lights are designed with a similar intent, which is to deliver the highest lumen output possible. Many lighting designers are not focused on the effects of high glare on the visible line of site. Our new Flat Optix ™ lens puts customers at ease by minimizing glare and providing increased cost savings along the way. This is a very exciting time for us at DECO, being pioneers in North America for bringing innovative lighting developments like Flat Optix™ to market,” says Ben Pouladian, President and Co-Founder at Deco Lighting. The all-new Circa round flat panel luminaire and the Skyler volumetric flat panel are at the forefront of Deco’s vision to bring innovative lighting solutions that deliver a more comfortable lighting experience to interior spaces. Featuring an optimal Unified Glare Rating, the Skyler and Circa luminaires comply with IESNA RP1-04 and EN12464 glare standards, which are specifications recommended for office and task lighting. State-of-the-art Flat Optix™ micro-prismatic lenses not only deliver exceptional glare reduction capabilities, but also provide excellent energy savings compared to fluorescent fixtures by illuminating key task areas where lighting is needed most. “At DECO we have always been focused on introducing new technology to the lighting front. We are known throughout the industry for our dedication to solving complex issues and have once again proved ourselves with our exclusive Flat Optix™ lens. Aiming to deliver value, quality, and comfort to our customers, we are excited to introduce glare-reducing lighting technologies, which will continue to solidify our position as a unique and forward-thinking lighting company,” says Sam Sinai, CEO and Co-Founder at Deco Lighting. 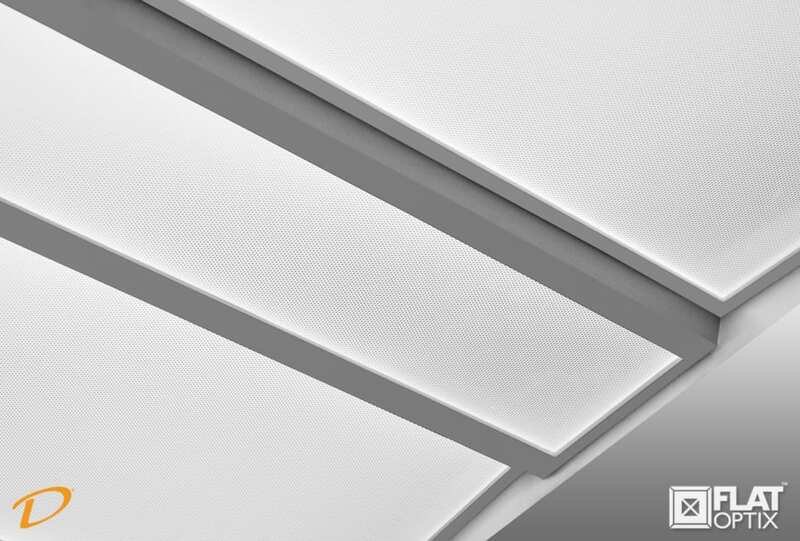 Equipped with the all-new Flat Optix™ lens, the Skyler recessed volumetric flat panel luminaire pairs a modern aesthetic with unmatched performance, perfect for complementing any interior area. Featuring a low-profile design, the Skyler is ideal for all standard 2×2 or 2×4 grid ceilings. With a sleek volumetric design, it provides enhanced luminous contrast between the fixture and ceiling. When compared to existing flat panels, Skyler delivers incredible performance with an efficacy of 109 lumens per watt paired with a CRI of 85 for accurate interior color rendering. The Skyler is available in color temperatures ranging from a warm 2700K to a neutral 4000K, aiming to easily match the desired ambience of an interior space. The Circa is a unique round flat panel luminaire designed to provide smooth, well-dispersed illumination to any architectural, commercial or institutional space. Constructed with the highest luminaire design standards in mind, the Circa has been engineered to reduce glare as the push towards higher efficacy has become more prevalent over time. 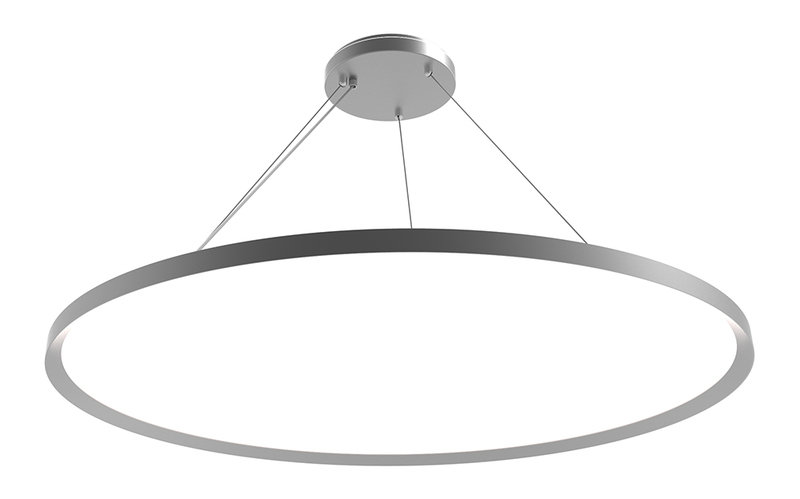 Available in 18”, 24”, and 36” diameters, it features a low-profile aluminum construction, perfect for ceilings with a low plenum space. The Circa carries next-generation performance at up to 109 lumens per watt and delivers up to 6500 lumens, all while creating soft and balanced lighting setting more suitable for the occupants of a space. Offered in color temperatures ranging from a warm 3000K to a neutral 4000K with a variety of sensor options for deep energy savings, the Circa’s sturdy construction and unique design make it a bold statement that complements forward-thinking interior designs. DECO’s revolutionary Flat Optix™ lens is at the forefront of practical and well-designed glare control solutions being introduced to the American lighting market. The micro-prismatic structures are precision-engineered to minimize glare considerably and comfortably illuminate indoor and task lighting areas. Flat Optix™ delivers an optimal Unified Glare Rating, which in practice is less likely to cause offensive glare in comparison to traditional luminaires featuring higher UGR values. The new micro-prismatic lens will continue to solidify DECO’s vision of delivering a myriad of technology-driven, human-centric solutions to the lighting industry. With plans to roll out a cutting-edge Architectural Flat Panel (AFP) in the upcoming months, Flat Optix™ glare-free technology will continue to make an appearance and complement DECO lighting products for years to come. DECO Lighting is a leading provider of next-generation LED lighting fixtures and systems for the architectural, commercial, and municipal markets. Based in Commerce, California, DECO aims to Digitize Your Light™ by delivering the latest in high performance lighting, superb customer service, and efficient control solutions for nearly any interior or exterior application. Continually winning industry awards and patents for their unique US-made products and designs, DECO Lighting utilizes the latest and most advanced lighting technologies to improve lighting quality, increase efficiency, and sustain the environment. Partnered with leading LED manufacturer Nichia, DECO Lighting offers the only 10-year warranty with labor in the lighting industry. DECO Lighting® is a registered trademark and Digitize your light™ is a trademark of Deco Lighting, Inc.